The first weekend of June always promises so much, what with the hope of good weather, plus two cracking fell races to get you through the weekend. Castleton takes place on the Friday night and with Edale that same weekend, on Sunday. For some it can also prove to be a tough weekend as they race both for others a bit of a dilemma as they decide which to race and to ensure they get their scores on the doors for the Gritstone Series. Fortunately, the sun shone, and entries to both events exceeded the year before which perhaps considering the contrast is of little surprise. these parts and had Series wins behind them already. With Stuart Bond, demonstrating some good early season form this looked likely to be a tough race. The women’s race was also eagerly anticipated with the inform Sally Fawcett challenging Helen Elmore at Burbage this was a race that could go either way. Helen, is well versed in the technical nature of fell running whilst Sally has a the turn of speed usually associated with the roads. Castleton, is a tough Derbyshire course and has a steep climb followed by technical descents and a fast run from the base of Back Tor to the summit of Mam Tor that is mostly paved. It was going to be a close call. And so it proved, at least in the ladies race. By the summit of Lose Hill and the end of climb number one, Sally had the advantage, just. Helen, had a game plan and by the time the foot of Back Tor was reached, her race face was ‘on’! Then as Sally passed through a mere 10 seconds later, it was clear that her grit and determination were to the fore. “Race On!” Mam Tor was reached with the two women neck and neck and the rush down to Hollins Cross unable to split the pair. Now for the final technical descent back to the last kilometre of road and then onto the finish. By the final curve at the foot of the main steps was reached a gap had opened. Advantage Ms Elmore. Yet with the road ahead there was no let up as Sally chased hard. Yet Helen should never be underestimated and her flat speed has improved this year. So it was that by the time the finish was reached a mere 6-seconds was the difference. The race resulted in a 40-second course PB for Helen and for Sally, encouragement before Sunday and the Edale Fell Race. For the men it was a different story. Seconds, in previous meetings, had so far separated Kristian Jones and Stuart Bond. Yet by the end of the first climb onto Lose Hill had been reached it was clear that Kristian was flying and that Mr Bond was off colour. And that was that, the race had been won and for Kristian who never once gave up on his speed, a new course record. 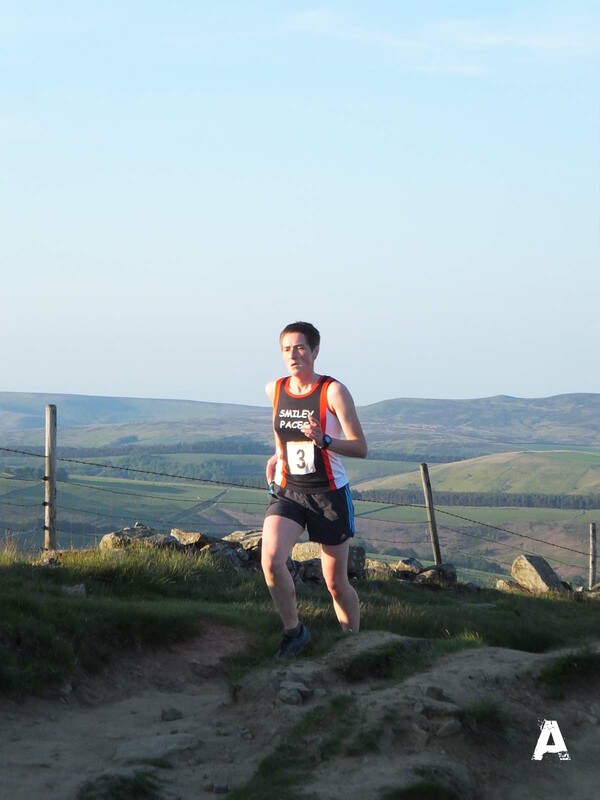 The biggest surprise in the mens race was the emergence of Ultra Runner and another of the Accelerate Supported Runners, Stuart Walker, who gunned it from the start to finish in 3rd spot, his highest ever placing in a short fell race. So that was Friday night, next stop Edale with Stuart Bond thinking about a win and Helen thinking about another hard race as Sally had confirmed she would be there. It was all to play for as wins equal much needed points in the Gritstone Series.